From cabinets to countertops and everything in between, The Cabinet Store prides itself on offering clients exceptional products made from quality materials. That’s why we support American made brands and have built partnerships with regional industry leaders from the Midwest. By building these strategic partnerships, we are able to provide our clients with the best of the best to ensure they love their finished project. 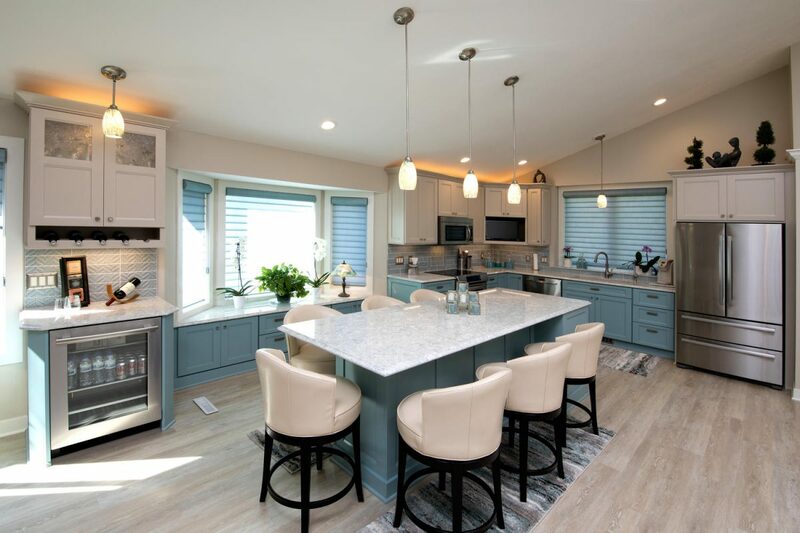 Cambria Natural Stone Surfaces (Le Sueur, MN) – Not only does Cambria offer the widest selection of quartz products, but they are also the only American company in the quartz surfaces industry. Showplace Cabinetry (Harrisburg, SD) – Showplace Cabinetry creates unique, built-to-order cabinets using materials sourced from the United States. Elkay (Chicago, IL) – Elkay, the top seller of stainless steel sinks, offers a variety of high-quality selections to help homeowners find the perfect sinks, faucets, and accessories for their home. Here’s why we support regional and American made products. The benefit of purchasing products made in America goes far beyond the prosperity it brings to the companies selling them. Not only does it keep hard-earned American dollars within the United States, it continues to bring in money from other countries while simultaneously helping the United States to limit trading debt. Encouraging consumers to purchase American made products also creates more demand and ultimately new jobs for American workers. While outsourcing manufacturing to other countries can cost less, it comes at a price to the environment. Many developing countries have very few (if any) environmental regulations. With less protections put in place, massive amounts of hazardous chemicals are emitted into the air, water, and soil each day. The pollution created by these manufacturing plants is only compounded when it comes to shipping. With a further distance to travel to reach its final destination, the carbon footprint only increases. When American made products are purchased by consumers, their money is used to guarantee environmental regulations are upheld. Protecting our planet is crucial and purchasing products made in America helps to create a healthier planet for future generations. Just like with limited environmental regulations, there are very few safety standards in place in the developing countries companies outsource manufacturing to. Products made in America come with the benefit of being subjected to strict consumer protection laws and safety standards. Because American manufacturers are required to obey these laws, consumers can rest easy knowing their products are free of materials classified as unsafe in the United States. We’ve all heard the horror stories depicting the awful working conditions of manufacturing plants in developing countries. Employees are forced to work long hours for a small wage in factories with little regard to the safety of its workers. When manufacturing is kept in America, it not only creates more jobs for American workers but also assures workers are paid livable wages and helps to reduce any gaps in income inequality. Our partnerships with regional and American made brands help us serve our clients better. Since the products we sell are made locally or within the United States, we have a direct line of communication to our suppliers. Rather than being held hostage by shipping or manufacturing delays from overseas production, we’re able to speak directly with our suppliers about product availability, timelines, or warranty questions. In addition to the environmental and safety regulations American made products bring to manufacturing, products made in America undergo meticulous testing to confirm their quality before they ever make it into the hands of consumers. That means consumers of American made products receive the highest quality products with a level of craftsmanship that is second to none.